I like few things more than writing posts that cause consternation. A recent gem was on my confusion over debit cards and who can forget my assault on the irrational fear of identity theft. So why not combine the two themes? Consumerism Commentary has a nice post today on writing "Check ID" in the little strip on the back of your credit card where you are supposed to sign it. Turns out that this is a relatively common practice and that it is against Visa and MasterCard’s rules. I guess I’m not really surprised at either of these facts. Why would a person write "Check ID" on a card? I can only assume that it is an attempt to deter a potential thief from using the card if stolen. Does anybody really think this would work? How often do cashiers actually look at the back of credit and debit cards? And then there are all the situations, from the self-checkout line to Amazon.com, that there is no cashier. Even if a cashier did read the back and asked a thief for ID, what would happen? "Oh jeez, I’m sorry. I left my wallet at home. I forgot that card said that. Never mind." The perp wouldn’t get to buy anything, but I don’t think an arrest would follow. How much of a deterrent is that? More to the point, why worry about a thief using your card? Your liability for fraudulent charges is zero. There may be a hassle factor, you might have to spend time on the phone discussing the situation with a customer service rep, but when the dust settles you are very unlikely to be out any money. Getting the card replaced can also be annoying, but remember we’re not talking about a deterrent against stealing cards, only using them once stolen. A person might wonder why Visa and MC don’t make checking ID a normal part of the purchase process or have all cards made with photos of the holder, as some card issuers do. They are, after all, ultimately on the hook for the fraud. I can only assume that they have thought about it, done the math, and decided that the current system is better for business. The cost of making cards more annoying to use outweighs the small potential savings in fraud reduction. That tells you something. I’d be marginally less incensed if I didn’t know that cashiers aren’t allowed to ask for ID. According to the rules set out by Visa and MC, the only thing a store can check is that the signature on the charge slip matches the one on the back of the card. Period. If that Asian looking girl can sign "John O’Sullivan" just like on the card, you’re supposed to put her purchases in the bag and wish her a nice day. That may not be a good rule, but it is the rule, and I don’t see why stores can’t live up to their agreements. I’m also pretty sure that as a middle-aged white guy I get asked for ID much less often than folks with certain other profiles. I’m not exactly the only person annoyed by this. (For example, see this about Radio Shack and this discussion board for cashiers at the world’s biggest retailer.) But we objectors seem to be greatly outnumbered by those who actually ask to be asked. And we are, after all, talking about a serious matter: buying stuff in stores. It’s not like we are discussing requiring ID for something so trivial as, for example, voting. That crazy idea inspires all sorts of opposition. I knew that writing “see id” on the back of a card was against the rules because my local post office has a sign indicating this. I didn’t realize that a merchant wasn’t allowed to ask for ID, though. My wife writes “see ID” on all of her cards. why worry about a thief using your card? Normal people appreciate that a system that encourages theft is going to break down in the end. We are not rationalizing robots, as so much economic theory posits. We see beyond the immediate transaction. That’ a good thing, not something to be mocked (in my view). The view that should be mocked (in my view) is the view of the card-issuers. I think you are right when you say that their take is that it is more important to get more people to use the cards than to prevent theft. They are looking out only for their own short-term profits to the detriment of the community as a whole. When the system breaks down, their profits break down too. But the system breakdown doesn’t show up on their personal balance statements, so it is the Factor That Is Ignored. I’d be marginally less incensed if I didn’t know that cashiers aren’t allowed to ask for ID. Could you point to the clause in every retailer contract that stipulates this? I’m pretty sure it’s untrue. It is true that writing “check id” on the back is against the rules, because the card is “invalid unless signed.” That does, however, not create a contractual impediment to retailers requesting additional proof of identity. And why would they do that? Largely, it’s because you’re wrong when you say They [card issuers] are, after all, ultimately on the hook for the fraud. Because they’re not entirely. The exact breakdown of responsibility isn’t entirely clear to me, but I do know retailers are on the hook for at least part of the fraudulent purchase, unless they were duly diligent in taking steps to prevent fraud. So some do take additional steps. It’s not to protect you, it’s not to protect the card issuer, it’s to protect their own bottom line. And I, for one, don’t have a problem with that. The back of my credit cards say “not valid unless signed”. That should speak for itself. Merchants are supposed to check the signature for face to face transactions. Most don’t bother. Its a goofy system but I think all parties are making a conscious choice to be lax on security since its hard to stop entirely and just considered a cost of business. Its like shoplifting. They take reasonable security measures but going too far to inconvenience ALL their customers to thwart thieves isn’t worth it to the businesses. 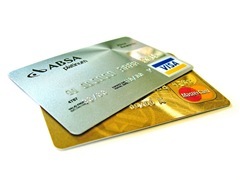 Credit card fraud is less than 0.1% of all transactions. Upsetting all your customers to try and save 0.1% isn’t worth it. I read that to mean that Visa doesn’t bar merchants from asking for ID but ID can’t be a requirement to accept a Visa. So it seems that a merchant could ask for an ID if they want but if the customer doesn’t present ID then the merchant still has to accept the Visa card. That would seem to make asking for ID by a merchant pointless but simply asking could be a good bluff or enough to scare of some thieves. I can’t find the Mastercard rules on this topic. ‘Unlike credit card transactions at brick-and-mortar companies, in which the bank that issued the card is usually liable for fraudulent transactions, online merchants are typically forced to cover the losses. I’m going to stop looking stuff up, because Jim is so much better at it. I’m sure with a few clicks he could find us a link about how the customer liability for a stolen card was once $50 but was changed a few years back to zero so people would stop worrying so much about it. The Visa rule that allows asking for ID, but not doing anything about it is more wonderful than I could have hoped. My understanding is that merchants are not on the hook for fraudulent transactions directly, but will pay a bigger fee if their store has a high average of fraud. So they have something of an incentive to cheat and ask for ID. Frank – really? I’ve been back and forth on this issue of liability (I would like to be able to give people the correct answer about this question, when they ask). I like to go to the source, and i found this from the FTC: http://www.ftc.gov/bcp/edu/pubs/consumer/credit/cre04.shtm I looked again today and couldn’t find anything that has superseded it. Help? About the $50 liability limit. I can’t find anything that disagrees with that and says theres $0 liability, EXCEPT the FTC site that Stephanie points to does have this detail “Also, if the loss involves your credit card number, but not the card itself, you have no liability for unauthorized use.” So if you lose your physical card you have up to $50 limit but if someone just steals your card number then you have $0 limit. Plus another detail, “If you report the loss before your credit cards are used, the FCBA says the card issuer cannot hold you responsible for any unauthorized charges.” so if you report the card lost/stolen before its used fraudulently then you also have $0 liability. So it really seems that you might owe up to $50 if your card is lost/stolen and you are slow in phoning it in, otherwise your liability should be $0. Who actually ends up eating the liability in the cause of fraud seems unclear to me. It seems that the banks or merchants share the liability with one paying it in some cases and the other paying in other cases. One anectdotal point : My sister & brother in law own a restaurant. My sister has told me that they get credit card transactions denied if they don’t have a valid signature on the receipt. So in that situation they eat the cost as the merchant. For them its usually not fraud but sloppiness on the part of the wait staff. Moreover, there’s actually unlimited loss if you don’t report within 60 days of receiving a statement which contains fraudulent charges (and a sliding scale between two days and sixty) so even $50 isn’t quite true. Cardholder who has complied with the conditions for presentment of a Card at the POI refuses to provide additional identification information, except as specifically permitted or required by the Standards.” This is Rule 5.6.3 in Chapter 2 on page 2-58 of the document here. As for merchant versus credit card company, I think you’ll find that it’s almost always the merchant who eats the losses. In almost all cases the merchant has to repay the credit card company for a fraudulent purchase plus a chargeback fee. Current U.S. law is extremely harmful to merchants who cannot protect themselves from fraud, but have to accept the losses due to fraud. Oops, ignore that last paragraph. I’m actually finding wildly conflicting information on merchant vs. credit card company and fraud losses. Naomi’s information could well be right. Honestly I’ve just left mine blank since I got my first card about 5 years ago. Partially out of laziness, and partially as a social experiment. In all the time I have had it, I’ve been asked for ID 3 times. If it happened more I’d sign it because it is a hassle, but like I said, it doesn’t happen often and I’m lazy. Yeah, that was my original point – federal liability is up to $50 (except in Andrew’s example), issuers currently waive the liability, but I wonder if that will continue to be the case post-CARD act. I also wonder why i have encountered this question on not one but two ‘financial literacy tests’ – of the ‘administered to K-12 students so that we can bemoan how financially illiterate they are’ type rather than the CNN toy type – when it’s of such little practical importance. I am not very good with English but I get hold this really easygoing to interpret .